Plot: Product Description: The Story of Adèle H (L’Histoire d’Adèle H., 1975) is the sublime François Truffaut’s frighteningly intense look at amour fou: the obsessive love that drives a woman to destruction. The woman is Adèle Hugo, the talented and privileged daughter of the most celebrated author in Europe; the object of her affection is a n’er-do-well English soldier, one Lieutenant Pinson. Based on fact, this titanically poetic film follows the infatuated Adèle as she trails Pinson from one end of the earth to the other, descending into madness and living on the fire of her passion. Directed by the master of French filmmaking, Francois Truffaut. What can be said about this master of film that has not already been said? If one mentions great directors, he has to be on the list. He is a passionate director that gave the world, a touch of meaning in his films. The Story of Adele H is no different when it comes to amazing cinema. This is truly a deep, grand, and utterly absorbing, dramatic film. It digs deep into you, and controls your emotions as you watch. Surprisingly this is my first time seeing this film, and I am blown away, by its dark beauty and intense emotional structure. This is a journey of love at its finest, yet at its darkest. For if one loves someone, and that someone does not love back, then the story takes on a mind of its own. This weaves mastery in acting, direction and music. The whole film comes across as a living reality, that the viewer can’t help understand, or most of all, fit directly into the story. I was inserted into the whole picture. The film is able to grab you emotionally. I am shocked, I have never seen this one. It’s a film that in my viewpoint, comes across as being in a world of its own. A one of a kind experience that only Truffaut could do. Truffaut accomplished so much with this vision. Twilight Time has done another wonderful and breathtaking job at bringing another forgotten masterpiece to Blu-ray. The film deserves to be seen in the highest quality, and Twilight Time has done that. This is another prime example of how to treat a film that is important. Twilight Time really never lets me down, and it never lets the movie world down. Twilight Time, through many of their features, bring thoughtful pieces of film to Blu-ray for the first time, and The Story of Adele H is one of those films. They have honored and given great respect to this film. If Truffaut was alive, he would be proud of this Blu-ray and the beauty given to it by Twilight Time. This is a mix of genera’s. It is equal parts historical drama, and also a mix of romantic situations, wrapped around a biography setting. This was nominated for many awards including the Academy Award for Best Actress, Isabelle Adjani. Adjani captures the part of Hugo in the reality of a flawless performance. You cannot say enough about her performance, for it is one of the defining performances in all of cinema. At the time, which is an amazing accomplishment, she was the youngest actress to have ever been nominated for Best Actress. The movie is the story of the real life, Adele Hugo. Daughter of a one of a kind, mastery in writing, Victor Hugo. Adele falls madly in love with a military officer named Pinson, played, also flawlessly by Bruce Robinson. The movie is based on Adele’s diaries. Adele was in total obsession for her love, yet that love would ultimately be her down fall, and destruction. Adele had a passion for love, romance, and one single man. Adjani brings that love affair and ultimate obsession to reality on screen, and is able to create a performance that digs deep into your soul and mind, as you watch. As I have stated this also stars Bruce Robinson. Robinson is a jack of all trades. Director, screenwriter and published author. He is an actor that sadly never really got the push he deserved. He is an amazing performer, and the part of Pinson is a defining example of that mastery. It’s his work behind the camera, or with a pen, that many will know him from. He wrote the screenplay for the 1984 classic, The Killing Fields, which he was nominated for an Oscar. Cult film fans, will know him from directing and writing, the cult film, Withnail and I, which came out in 1987. This movie was about his life and structured in a black comedy way. Most recently, it would be his screenplay adaption and directing of, Hunter S. Thompson’s The Rum Diary that people would recognize, which starred Johnny Depp. Now I have always been a huge fan of Isabelle Adjani. The reason way, is not only for her amazing acting, but it is because, she stared in one of my favorite dark horror films of all time. The deep and twisted 1981 masterpiece, Andrzej Zulawski’s Possession, which I wish someone would bring out on special edition Blu-ray, (hey Twilight Time, Hint Hint). Adjani won best actress at the Cannes Film Festival for the role in Possession. In all her films including, The Story of Adele H, Adjani is able to craft a deeper, darker and emotional ordeal through her performances, that I don’t think, anyone can do, accept her. On a side note and a little trivia for all you movie lovers reading this, she and actor Daniel Day Lewis had a relationship, and had a son together named, Gabriel-Kane Day-Lewis, who is a hip-hop performer. The Story of Adele H, not only captures that excellence in performances, it also leaves one of the greatest impressions upon the watcher. Now a movie can’t be excellent without the mastery of a perfect director. After seeing this for the first time, it only makes me realize all the more, in how amazing and important Francois Truffaut was to film. We lost this master at such a young age. 52 years young. I can only imagine, all the craftsmanship that he would have brought to the filmmaking world, if he would have lived. Not only a master director, but a master writer. He was able to bring so much heart and soul to his films. The Story of Adele H is that prime example. Francois directed some of my favorite films, such as the masterpiece, 1959’s The 400 Blows, The Bride Wore Black which Twilight Time has also released on a Special Edition Blu-ray, which you can read my review here for it: CLICK TO READ REVIEW .He also did the film adaption of Ray Bradbury’s Fahrenheit 451. He was one of the best and brightest French Filmmakers in cinema history. 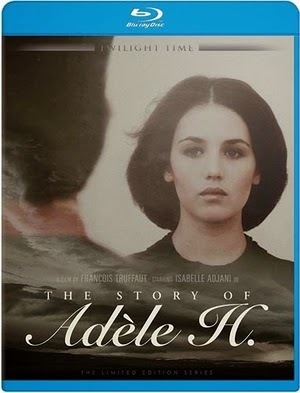 The Story of Adele H is a film that should be seen and respected as being one of the great French Films or films period. Now you can enjoy this wonderful film on this beautiful stunning product. An amazing transfer onto Blu-ray by Twilight Time. This special edition 3,000 Unit Disc, is highly recommended by A Bucket of Corn and should be experienced. A flawless video and audio experience. Audio: French and English 1.0 DTS HD-MA. Subtitles English SDH. There is no fault in this department. The audio and video is spectacular. The imagery, even with the film’s darker toned, or bleaker atmosphere, the film is vibrant and crystal clear. As I have stated, I have never seen this before, so I have nothing to compare it to, but what I can see by this Blu-ray presentation, it could not be any better. The audio is the same. The music and effects and dialogue are all clear. You get the amazing isolated score, which many of the Twilight Time Blu-ray’s come with. That music score is lovingly composed by a true treat to anyone’s listening ability, Maurice Jaubert. Sadly Jaubert would never get to see his work respected by director and visionary Truffaut. Jaubert died at the young age of 40. Truffaut would use the mastery of Jaubert in many of his films. All one has to do is listen to the music and realize how amazing Jaubert was. You also get a fantastic audio commentary by film historians Julia Kirgo and Nick Redman. This is in reality, one of my favorite audio commentaries. I love listening to the expertise and knowledgeable understanding of these two. Both are very important to the world of movies. I think both of them are two people that respect film and understand film and cherish film, like so many do, including me. It’s always a treat to hear both of them, and this is no different. 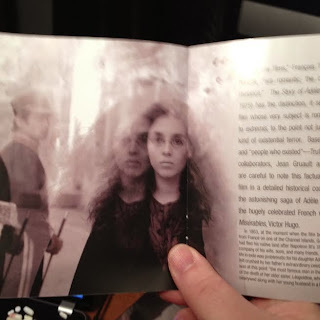 And as always the amazing little booklet that comes with Twilight Time Blu-rays. Loved this as always from Julia Kirgo. Also this is limited like always to 3,000 units of production. A must see film. An important film of mastery. Some of the best acting ever. Isabelle Adjani is breathtaking in this part. The direction is flawless. This is a blu-ray of perfection in audio and video and transfer. I highly recommend this for any lover of cinema. This is one of those films, now after seeing it for the first time, I consider it, a film that is required viewing, of those considering themselves, film lovers.